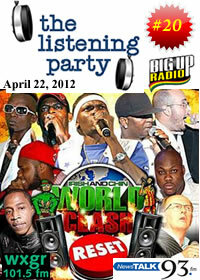 The Listening Party #20: "Sound Clash past present and, future"coincides with the staging of World Clash R.E.S.E.T. in Montego Bay, Jamaica held Monday April 9. Interviews with clash/competitive sound systems from Jamaica from the 50s until now, TLP 020 explores the status of the scene, its past, present and future, with Count C, Gary Exodus, Garfield ‘Chin’ Bourne, Cleveland ‘Clevie’ Browne, Father Romie, Walshy Fyah and Ricky Trooper.